It is fitting that producer Dean Devlin would make his directorial debut with a film like Geostorm. Devlin partnered with global destruction extraordinaire, Roland Emmerich, on films such as Independence Day and Godzilla, and is no stranger to large scale carnage. Geostorm would never be mistaken for a good film by any basic critical measure. It's big, loud, exceedingly dumb, and lacks any discernible sense of basic logic. And yet, it's so unselfconsciously ridiculous that one almost can't help but admire the way in which it throws reason to the wind and goes all-in on its unabashed outlandishness. It almost feels like something that should have been released in 1997 rather than 2017. It's a hilariously implausible disaster film set in a near future where the world has come together to devise a global network of satellites that can control the weather in order to combat the effects of global warming. The world appears to have been saved, that is until satellites begin malfunctioning, resulting in isolated extreme weather events. So the United States government calls upon the network's volatile mastermind, Jake Lawson (Gerard Butler), to fix the problem. What he discovers isn't an isolated bug, but a hack whose aim is destruction on a global scale. If the malfunctions continue, it will result in a worldwide storm event that could wipe out the majority of human civilization. It matters little who's behind it all. The answer is both obvious and outrageous all at the same time. Geostorm is just interested in getting to the action, and it more than delivers on that front. This is a film that understands and appreciates its own silliness, and embraces it wholeheartedly. Yet it's not that kind of ironic, tongue-in-cheek awfulness of something like Sharknado. There's a sincerity about it that is kind of endearing. The characters are cookie-cutter, the exposition is clunky, the power-anthem heavy score by former Hans Zimmer protege, Lorne Balfe, sounds like 100 other standard action movie scores. But somehow, it all comes together to make something so generically inoffensive that its familiarity begins to work in its favor. It feels completely incongruous to what's cool in 2017, but it's that dogged sense of unabashed revelry in pure, cinematic destructive spectacle that makes the film so compulsively watchable. Its science is pure junk, its plot twists inane, its script unadulterated nonsense, but in spite of all that, it remains a gleefully over-the-top piece of pop trash that has but one thing on its mind, and delivers it with such conviction that manages to succeed on its own terms. 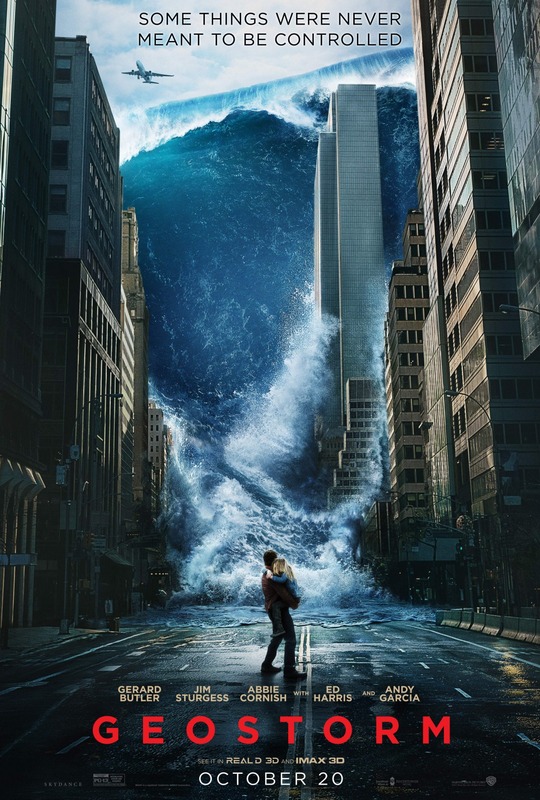 Geostorm is no work of fine art, but it sure is a hell of a lot of fun. GEOSTORM | Directed by Dean Devlin | Stars Gerard Butler, Jim Sturgess, Abby Cornish, Alexandra Maria Lara, Daniel Wu, Eugenio Derbez, Amr Waked, Adepero Oduye, Andy Garcia, Ed Harris | Rated PG-13 for destruction, action and violence | Now playing in theaters everywhere.